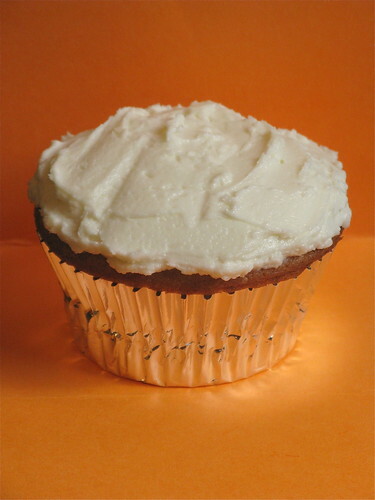 The idea for this cupcake came from my wanting to bake using the sweet potato butter I made earlier this week. Then I was chatting with Kris at To Be Mrs Marv & she mentioned a pumpkin cookie with a goat cheese & honey filling. 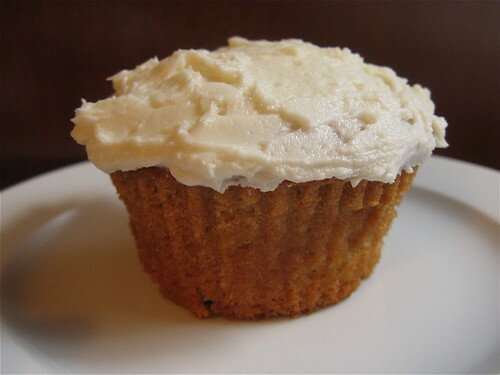 That got me thinking that goat cheese & honey would make a fantastic frosting for the sweet potato cupcakes . I had hoped to make this my Iron Cupcake - Cheese entry but got a little behind this month & missed the entry date by 2 hours. We are torn on the finished cupcake here at Chez Good Appetite. Matt & I agree the cupcake is fabulous! The flavor of the sweet potato butter with just that little bit of cinnamon & allspice in it really comes through, especially since I used a little as filling too. The cake is nice & fluffy like a cupcake not heavy like a muffin. Where we are torn is the frosting. Matt thinks it tastes too strongly of goat cheese & doesn't like it. I really like it & think the tartness of the goat cheese perfect with the sweet cupcake. 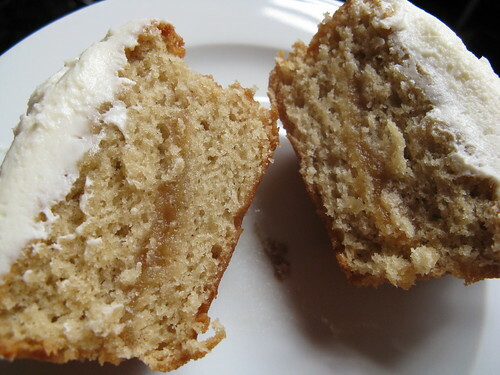 I think the honey gives the frosting a subtle sweetness that sugar wouldn't. I would definitely make these cupcakes again but would probably make a cream cheese frosting for them so that everyone in the house will be happy. Preheat oven to 350 F. Prepare 4 muffin tins. In a small bowl mix the 1/4 c sweet potato butter, baking soda & baking powder together. Mix in vanilla & egg yolk & set aside. In another bowl whisk the flour, sugar & salt together. Add the butter & 1/2 the sweet potato mixture & beat until light & fluffy. Add the remaining sweet potato mixture & beat a few more seconds. Put about 1 heaping tablespoon of the batter in each muffin tin, smooth out to flatten. Spoon 1/2 t of sweet potato butter on top of the batter in each tin. Top with remaining batter. Bake for 23 minutes or until golden brown & a toothpick inserted into the center comes out clean. Allow to cool on a rack completely before frosting. Put everything in a bowl & beat with a mixer until smooth & creamy. Very original and looks delicious! What a great looking little sweet treat. I love the photo w/ the orange backround. The frosting sounds really good to me- but I love goat cheese! I love apple butter and adore sweet potatoes so I'd love to try that sweet potato butter! I know these cupcakes would've won that challenge, they sound delicious...I really like the way you incorporated the cheese :)! I've got to make me some of that sweet potato butter! !